Why Choose Automatic Sliding Gates? Stay With The Times! Any sophisticated house you visit will have automatic sliding gates. That has become a new trend that people with a classy taste follow. It does sound like a lot of hassle to step out of your car, open the gate, and then drive out and you have to do the same when you get back home. Also, with time, the iron tends to get rusty and it takes a bit of effort to open them. It is much easier and efficient to get automatic sliding gates installed in your home. You might say that a security guard or a doorman is enough to operate the gate, but then that is an added expense. Not to mention, the gates could get rusty and moving them could be difficult. Also, it takes time for your security guard to open the gates, so you can commute. 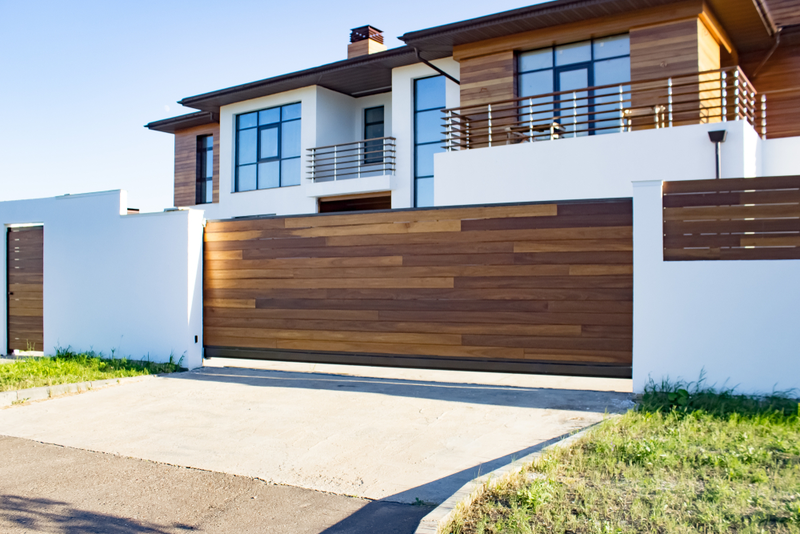 All this hassle can be prevented if you install automatic sliding gates at the entrance of your house. Not only does it denote class and grandeur, automatic sliding gates are great for people who usually have a busy schedule to keep up with. People who like to stay with the times and not be one of the traditional members of the society prefer having automatic sliding gates in their premises. #1. Save money: There is no question that you have to pay a lot to your security guard to just stay at the gates and open and close them as and when required. Also, he might not be around all the time. However, automatic sliding gates on the other hand are far more efficient. It takes much lesser time, zero effort, and does it smoother than ever. The only cost involved here is the price of installing the automatic sliding door system and the occasional maintenance costs. Otherwise, you are good to go. #2. Experiment: There are so many different aspects that you can experiment with on the automatic sliding gate front. You can choose the different designs, the material (iron, steel, etc. ), the color, and even the mechanism. For example, you can choose to have it open on voice command, fingerprint unlock, or even sensory motion. You can have the latest security technology installed with it so that it performs optimally and efficiently. You can get whatever you want. #3. Comfort: Gone are the days to open the front gate yourself or calling up the absent security guard to open the gates for your guests. You can now check who is at the front gate through the security cameras and open the gates to your premises remotely (while inside the house itself). 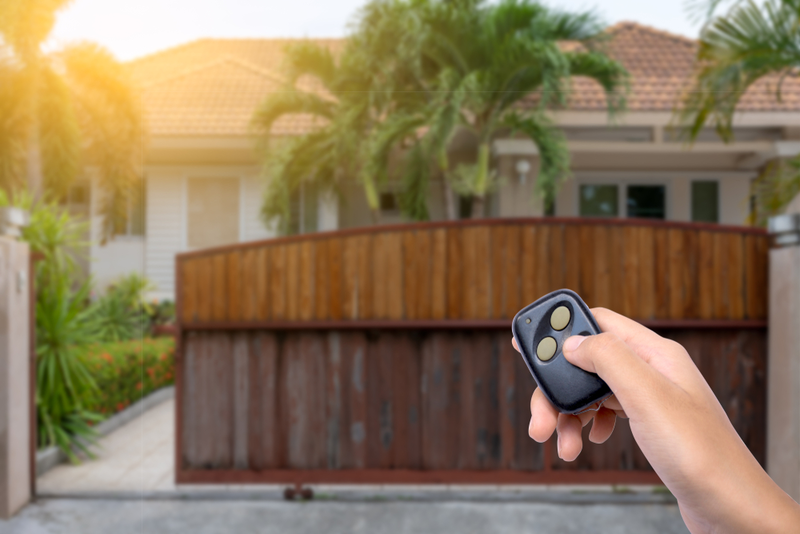 This means that you don’t have to make the effort of being courteous enough to open the gates for your guests – your automatic sliding gates shall do it for you. Besides, you can monitor any suspicious activity at your gate with security camera. #4. Setting an impression: Everyone loves technology and a person who is up-to-date with the latest trends is someone everybody looks up to and admires. Automatic sliding gates are the new big thing and having it installed at your gate would fetch you some real compliments. It looks fancy and tasteful. Thus, you can install them to put an impression on the visitors. These are only a few of the many advantages that one can enjoy if he or she install automatic sliding gates on their premise. This is a trend that most people are following nowadays, so make sure you don’t fall behind. Steel and aluminum are great choices when you are choosing your fencing material for durability, design and minimum amount of maintenance. Both the steel and the aluminum fences are maintenance free which means that you will get to enjoy in your yard and not have to spend working fixing your fences! One of the most important things to notice is that the fences which are made out of wrought iron or aluminum are something that you can afford quite easily so you get to have the proper amount of privacy in your lawn and not burn a hole in your pocket to install the tubular steel fencing. There are certain differences that exist between tubular steel fencing and aluminum fencing and depending on those you can choose the one that you like for your yard. These are the 3 factors one should keep in mind while choosing between the two. These 3 are the deciding factors of your final choice. Strength and durability: When the traditional fencing is concerned it mainly consists of the ones which are made out of wood. But compared to that, steel and aluminum fencing is quite sturdy and durable. Aluminum is impermeable to materials which cause corrosion and rust. 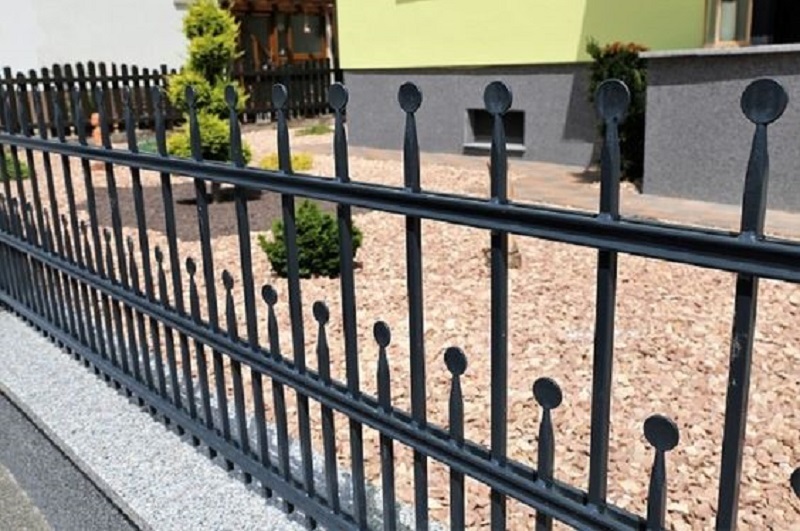 When it comes to tubular steel fencing, however, they can corrode due to rust but if you were to add a protective layer to it, then it remains maintenance free and quite well-protected. Style: Steel fences come in a lot of variety and styles but compared to the steel fencing aluminum offers a lot more options in colours. If you want the style of your lovely home, then choose the colour and the style of your which will compliment the overall look. The tubular steel fencing comes in a lot less colours and the styling options which are there for both the fences come in a great number of variants as well. Cost: Aluminum fences are less expensive than the wrought iron fences or the tubular steel fencing. The ornamental steel or the aluminum fencing that you choose to buy come with protective coating which call for little to no maintenance at all, over time. So the extra money which you will spend on these fences will be worth it. Using tubular steel fencing for your next project: look at the pros! 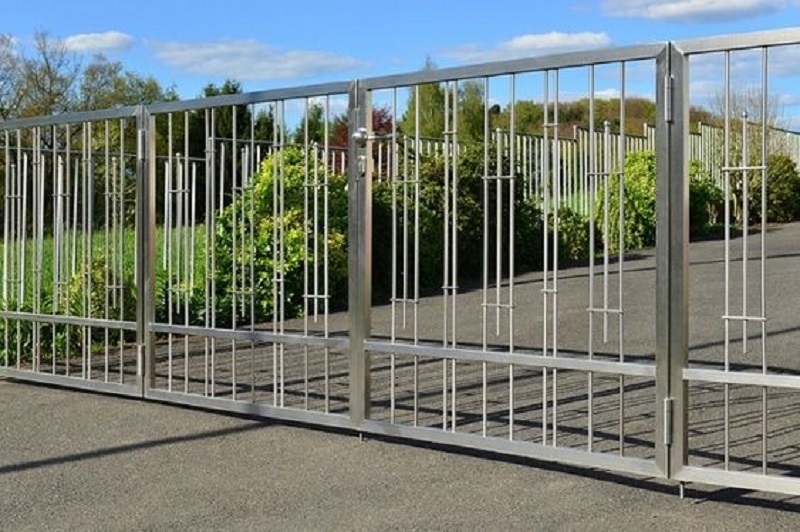 Even though aluminum fencing tends to have the advantage of costing less and having a lot more variants in colours, there are certain pros to tubular steel fencing too which are quite unparalleled. The benefit that the tubular steel fencing offers to one’s property is quite unmatched. It gives a certain amount of strength and security which aluminum fencing cannot provide. Some people tend to like steel fencing just because they find it a more attractive option as compared to the aluminum fencing. They provide for a long-lasting barrier which is important in increasing the maximum security of a property. If cost is not an issue on your side you can easily opt for the steel fencing since it provides for a more customized style to your property. These tubular steel fences provide a good amount of security which is crucial to any sort of home. When the steel fences are coated with powder they actually become far more resistant to corrosion and rust than aluminum. The tubular steel fencing becomes an attractive option for those homeowners who tend to have both appearance and security as their priority. Renovating homes or moving to a newly lovely home is certainly daunting. Setting up in a new place is still an easy task but shifting from one place to another and getting rid of the unnecessary old stuff is tiresome. It is difficult to find the perfect place to dispose of all the old stuff. But it is not necessary to dispose of everything, right? One might even want to sell their old belongings. This is even a bigger problem because now we are stuck with the question, “where to sell?”. This can be a tormenting question which can be bothering for days till the time it does not get sorted out. One of the most common items which one might want to sell off is a mattress. So, let us discuss the essentials of where and how to put up a mattress for sale. The condition of the mattress: One must be very careful about the mattress they are selling. If the mattress being sold is not in the state which the buyer wants it to be, then there is no way that they are going to buy. People carry out strict checks before buying a mattress. This is because mattresses are an essential object, it’s the place where people come crashing into at the end of the day, no matter what kind of a day they had. A person will not be able to sleep or take rest on a mattress which is not in a good condition. A mattress needs to be clean, needs to smell good and also be comfortable enough to sleep in. Price: Mattress for sale second hand obviously need to be lesser than the market price of the mattress. But one must take care that they don’t keep it underpriced or over-priced. The price of the mattress needs to be proportional to the condition of the mattress. If the mattress is as good as new, then it needs to be sold almost near its market price. Similarly, if the mattress is in a poor but saleable condition then it should be sold for much lesser than the market price. Miscellaneous uses: Before putting up a mattress for sale make sure that there aren’t any uses for the old mattress in your new or renovated house. A mattress can be used for many purposes except just bedding. One can bring out the artist in them and show off their artistic potential by making helpful objects such as racks and birdhouses using the springs and foam found inside the mattress. Mattresses also form really good compost for plants to grow in. They can be also used to create a small safe-zone for children to practice stunts and play in. Where to put up a mattress for sale? The first and most obvious choice will be to sell online. Selling online is a great choice, one can find a lot of potential buyers when putting mattresses up for sale online. But it also comes with the disadvantage of how trustworthy these potential buyers are. Online buying might sometimes be a safe option. If selling online isn’t your cup of tea, another place to sell your old mattress is mattress store. Yes, if you are planning to get a new mattress then you might consider selling your old mattress to the same shop you buy your new one from. One might even try to sell their old mattress in open garage sales, though people won’t be willing to spend much in such sales. Isn’t it relaxing imagining yourself by the side of your pool with a cold drink and a book in hand? If you are planning to remodel or renovate your swimming pool, there are countless possibilities for adding pool features and enhancements you can consider. Incorporating additional features to your swimming pool area will enhance and customize your backyard environment also. Some of the smallest changes can make a difference if you remodel your pool. These features not only will add enjoyment to your swimming pool experience, but also add value to your lovely home. If you want to know more, then keep on reading! Adding a number of water features to your swimming pool during a pool remodel can improve the whole backyard environment. Having a water feature lets you enjoy the soothing sound and the sparkling sight of falling water. The perfect complement to a lagoon style or free-form pools is a creative waterfall. This is a great visual interest and adds beauty to more standard shapes. You can opt for natural-stone waterfall made with stones accumulated from your region of the country with water flowing over them into your pool. Look for companies that offer natural-looking artificial stone waterfalls for a fraction of the price of natural stones. You may add a full rock wall complete with streaming water to one end of your pool and enjoy the impression of relaxing at the foot of a mountain. If you like to add a romantic feature, you may create a private rock cave unseen behind your new waterfall. To make your cave even more appealing, you can add underwater seating ledges. Fountain bubblers are fairly inexpensive and would be perfect if you have kids at your home. These bubblers extend upward like mini-geysers and are usually constructed into a pool’s shallow sun ledge. Another fun water feature you can consider are deck jets as they shoot streams of water from the deck to the pool, but be sure to place them properly to function well. If you like to be a little extra, you can get dramatic with laminar jets. They give a solid flow of bubble-free water plus you can add color by illuminating them with fiber-optics. You can install wind sensors in case of water splashes onto walkways and other areas. These sensors are helpful to shut off the jets when winds go over 5 mph. A water slide is probably the best addition you can have for your pool. It will give your pool landscape the experience of a water park in your backyard. Plus, it can be enjoyed by both children and adults. Modern swimming pool slides today come in different sizes and shapes. You can choose a straight quick drop into the swimming pool or the one that provides a gentle curve to the left or right. It’s possible to build slides into other pool features, but just make sure that you meet the safety guidelines given by municipal building codes such as that when a swimmer slides, he or she must fall into water that’s deep enough to be safe. Aside from all that fun, you can also promote some health and wellness by adding a spa for your pool area. Warm water therapy or also called as hydrotherapy is made up of main healing ingredients; heat buoyancy, and massage. Hydrotherapy is more than just providing relaxation and pleasure, it can do wonders for your physical health benefits. You may not know that water can do the most amazing things in life. Spending time in hot tub spas can give you therapeutic benefits if you are experiencing joint or muscle pain, having trouble sleeping, or simply stressed out. If you keep a pool for fitness purposes, why not add resistance jets? This will benefit you the most especially if you have a lap pool. Installing these jets will provide swimmers endless currents that they can swim against. Swimming is a fun activity and an effective workout for your muscles. It’s great for adults and children who want to watch over their health and fitness. For a more appealing pool, you can choose to have a well-lit pool with interesting lighting designs. Using lights can highlight your best features, you can take your yard, landscape, and pool size and design into consideration. It may take more land analysis if you have curvilinear pools than rectangular ones. Take note also the texture of the pool’s interior. The shadow affects you may have on the surface material will depend on the lighting source you have which sometimes can highlight subtle imperfections. Fiber optics employ end-emitting or side-emitting fiber-optic cables which transmit light from a faraway distance located into a high-intensity discharge lightbox. The side-emitting fiber-optic lighting can be installed under the pool’s coping or in the wall of the pool. Plus fiber-optic can produce a soft and uniform lighting effect. On the other hand, LED or Light-emitting diodes are also great for outdoor illumination and can fit effortlessly into an electric circuit. Nowadays, a lot of people choose LED lights over incandescent bulbs because they don’t get hot or have a filament to burn out. In order to establish an atmosphere of comfort and safety in the pool area, additional lighting is necessary. In order to know where to effectively establish that atmosphere, you must know where pool owners spend most of their time while outdoors at night. Angle the light toward surrounding beds, allowing it to spill onto the deck, instead of lighting the pool deck directly. If you have a tree canopy that hangs over the pool deck, moonlighting or downlighting can provide a mystical effect. Your tree-mounted fixtures should be at least 30 feet above the ground, with soft tones filtering through delicate limbs or lacey leaves to kindle fine shadowing on the beds and walkways below. If you want to add a touch of class to any setting, you can use soft uplighting. You may create a wall of light using a series of visibly appealing trees. The trees do not necessarily need to be on the edge of the property, instead to be close to the pool deck which will narrow the view to the immediate area. The rule you can follow is that the brightest lighting should be the most distant. About the Author: This article was written by Ivandrea Ollero, a resident writer for PAAL Kit Homes Australia, one of Australia’s kit home leaders that offers a range of flexible kit house designs options. Ivandrea writes information for people who want to achieve confidence in building their own homes. Sydney is one of the best places in the world to work, study, and raise a family, what with its good climate, stunning parks, gorgeous beaches, thriving business centers, and excellent educational system. No wonder countless individuals are interested in making this city their new residence. If you are planning to make the move (perhaps for better employment opportunities or for a fresh start for your family), it’s best to keep in mind that moving house is a laborious task that involves several important steps. You might be thinking about going the DIY route, getting as much of the work done yourself and simply asking for assistance from family and friends when time and energy constraints begin to take a toll. 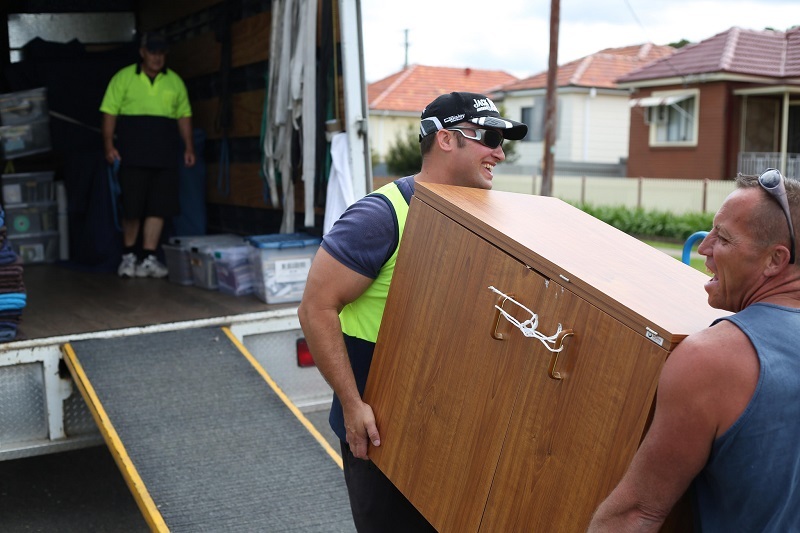 But while there certainly are aspects of the removal process that you can deal with on your own, like canceling subscriptions and closing accounts with utilities providers, there are also tasks that would be much better handled with the expertise of trusted Sydney removalists. These include packing and lifting several boxes of goods and heavy furniture. Removals companies must consider a lot of things, such as the distance to your new home, accessibility, parking, and how much you want to get involved in the removal process. But they will take full responsibility for transporting your items to your new residence. They will stack and organise your possessions safely in their vehicles as well as drop them off in their intended spot at your new abode. Reputable Sydney removalists will keep an inventory of your things to make sure that everything has arrived safe and sound. This document is also your reassurance in case something gets broken or lost during the transit. If you invest in professional packing and unpacking services, the removalists will not just unpack your boxes but will also organise your furnishings at your new home. Rest assured that with professional help, you can have a stress-free, successful removal on the same day. There are tasks or demands that removalists won’t be addressing because these go beyond the scope of their job. For instance, they will not be transporting flammable, hazardous, and explosive items. But if you insist on taking such items with you, talk to them so they can make all the necessary arrangements. They could, for example, refer you to a company specialising in transporting these goods instead. If you will be taking perishable items, you have to transport them yourself or these must be moved separately, which is also the case for plants and pets. If you choose to pack your items yourself, the removalist may refuse to transport them if the boxes are damaged or very likely to get worn out during transit. To prevent this, ask the removalists if they can provide you with high-quality packing supplies. Alternatively, you should get packing materials only from trusted suppliers to ensure the safe transport of your possessions. Below are the things you should do before your hired removalists arrive at your home. This will make the removal process easier and go faster. Go through all your items and sort them out. Take only what you need and get rid of the unnecessary ones. Remember, movers will charge you by the volume of your goods, so the fewer items you have to transport, the lower the costs will be. List all the items you want to move, especially the heavy and bulky ones. This will save you and your removalists a lot of stress and time. Send them a copy ahead of your moving day, emphasising the number of furnishings that must be disassembled for safe and easy moving. Also, you should take measurements of spaces like hallways, doorways, and entranceway. This will help them come up with a moving strategy, especially if you have lots of huge furniture in your narrow living space. Separate the costly pieces from the other furnishings. Also, get rid of all items inside the cabinets, couch, dining table, drawers, and shelves to save the removalists the energy, stress and time of assisting you in removing these things before packing. In addition, make sure that every appliance that tends to build up dirt and grime like the refrigerator or oven is clean and ready to use once you arrive at your new home. Also, you should have your carpets or sofa cleaned professionally. The removal process can be daunting and stressful. But with expert help, this can be made easy and hassle-free. Make sure to choose the right removalists offering flexible and affordable relocation services that match your needs and budget. About the author: Robert Wise, Sales Administration Manager at Nuss Removals, has been a respected figure in the removals industry for over 20 years. His attention to detail and the ability to truly understand the needs of the customer have ensured the successful relocation of thousands of satisfied individuals and families.